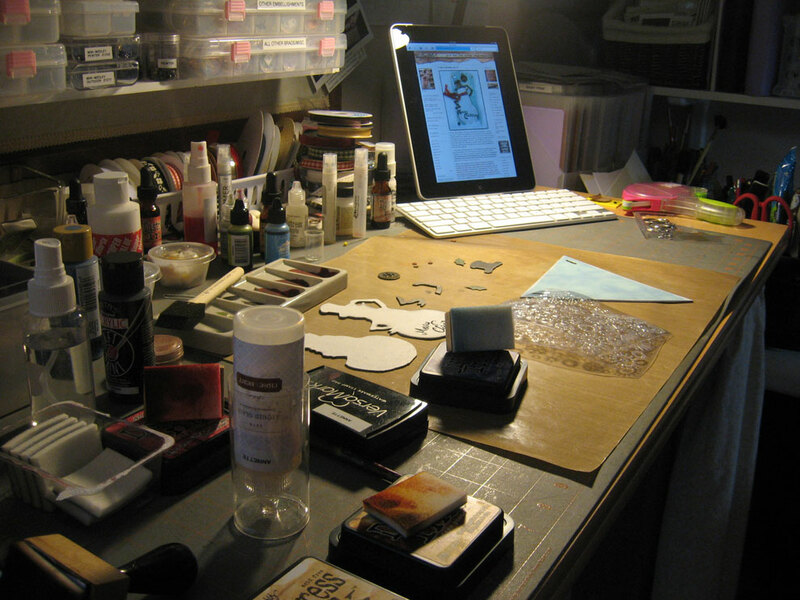 It's getting late and I am just now able to finish today's tag. If you haven't visited my blog in a few days, it might be a good idea to peruse the past couple of posts, because frankly I'm getting tired of repeating myself. It didn't take me all day to do this one. No. Because this one was actually a very simple and quick one to create. It's just that hubby had the day off, so it was Starbucks in the morning together (one of my favorite couple things to do) then a few errands, then a pop-in from my gal-pal Lisa, then lunch with hubby, then dropping off sleepover gear to my darling daughter, etc. So I kept working on my "tag" here and there throughout the day. I will say this again, and that is "You must go visit Tim Holtz's blog and follow along all of his steps through this tag." He takes the time to show each and every step, explain all the techniques along the way, and also shares some bonus ideas at the end. I love how he puts a festive background behind his tags for his feature photo. This tag is so darn clever because Tim repurposed some clear plastic packaging material by embossing it with snowflakes and layering it over his tag elements. Genius! I had a lot of the supplies that Tim used for his tag, so I didn't have to work too hard trying to replace too many things. The triangle shape was a slight challenge, but I managed okay. The main issue here was the embossed plastic. I had to cut a larger piece than Tim's to accommodate my triangle, therefore had to emboss the piece of plastic in two swipes, which actually worked out nicely in the end. I decided against using washers mainly because all we had were regular modern-day washers and I couldn't seem to change their color to work nicely with the brads. I think they would have been too large in the corners anyway, so just brads for mine. 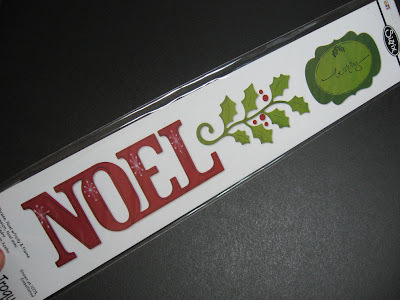 I didn't have the Martha Stewart holly punch, so I used a Sizzix die instead. Even after shimming, this die did not cut through the grungepaper. Not meant for that evidently. So I grabbed the Tonic scissors and helped them along. I punched the berries out with my Crop-a-dile, which will punch a hole through a car door, I swear! I had to substitute my Cuttlebug Snowflake embossing folder for Tim's. 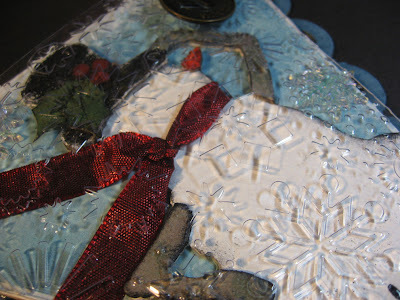 I also snuck a few clear plastic snowflakes under the embossed plastic to add just a little more layering and interest. 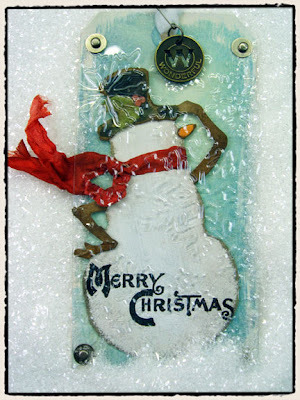 My "Merry Christmas" is from Close To My Heart's stamp set called "Wonderful Season." Here's another look at my tag. Thanks for stopping by. I think I'll go have a glass wine with hubby now. I can't wait to see all the parts assembled into the banner. It is going to be wonderful. I have been looking at Tim's and Annette's version each morning. Sad that it is ending. Fabulous!!!!!!! You make me laugh out loud (thankfully I had NOT just taken a sip of coffee) with the comment about the crop-a-dile punching through a car door! Too funny!! 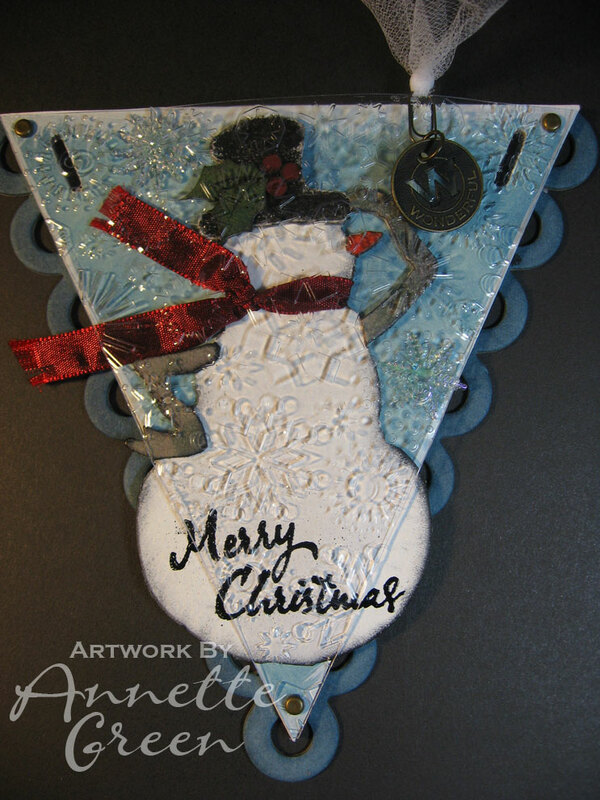 I am in awe of your work Annette, and saving these in a special "Annette" inspiration folder. Thanks for sharing - excellent work! I was wondering how you were going to get that snowman on that triangle! But it turned out beautiful! Awesome job! Beautiful! Can't wait to see them all strung together. Fabulous!!!! your artwork is breath takening!!! !